A Room of Our Own: A Feminist/ Womanist Network is a women-only multi-media platform created to share women’s writing, art, music, vlogs, campaigns and other creations. It was created both to combat cultural femicide – the term coined by feminist writer Bidisha to define the erasure of women from politics, art, and culture – and celebrate women’s creativity in a space without men. Women only spaces are a fundamental part of the feminist movement and represent women’s right to self-determination and liberation. We’re collecting short stories, poetry, and essays that illustrate and explore what we mean as a ‘woman only space’ and the importance of these spaces for the feminist and womanist movements and women in general: as a space which prioritises women’s voices over mens and that refuses to allow men to dictate the terms of the conversation. Anthology of Women Writers to help financially support our network! 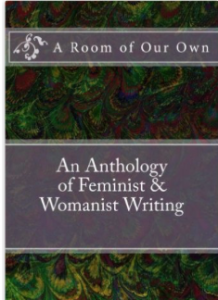 Check out our fabulous anthology of women’s essays, poetry, and short stories and help financially support our feminist and womanist network! Here are some of the books written by our members. We’re in the process of updating this section. If you’re a member, please send us links to any we may have missed. If you’re not a member, you can join us here and submit your books (including self-published ones! ).